The conditions under which early lifeforms originated and exploded into the many animal groups we see today is a mystery that has confounded scientists for decades. New research suggests shallow marine environments were a critical testbed for these early animals, providing the perfect space for them to evolve the physical characteristics required for them to move beyond their nearshore cradle. Microbes were the only form of life on Earth for thousands of millions of years. But then something remarkable happened: complex, multicellular organisms, including animals, appeared. Seemingly overnight, these new lifeforms diversified into all sorts of kooky creatures, expanding to fill virtually every nook and cranny on the planet. The habitat within which this crucial transformation took place, however, is poorly understood, owing to a dearth of fossil evidence. New research published today in Science posits the theory that shallow, nearshore environments were critical to this biological revolution, and that all vertebrate groups alive today emerged from these sorts of marine environments between 480 million to 360 million years ago. A fascinating implication of this research, aside from providing new details about the origin of complex vertebrates, is that it could tell us something about how life emerges—or cannot emerge—on other habitable planets. Without shallow waters, this new research suggests, early life might remain stuck in a primitive mode. Artist’s depiction of an early jawless fish, from about 430 million years ago. 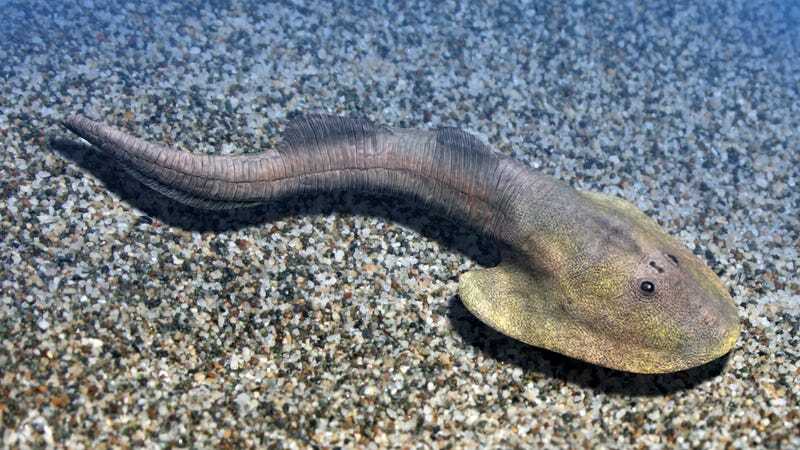 Prior to the new study, biologists suspected that early vertebrates may have emerged and evolved in shallow waters, but some suggested they evolved in freshwater, the open ocean, or even amongst coral reefs. With evidence lacking, however, scientists couldn’t be sure which of these interpretations was correct. Part of the problem, according to Lauren Salan, the lead author of the new study and a researcher at the University of Pennsylvania in North America, has to do with the sheer lack of fossils. The fossil record of vertebrates is rather pathetic for tens of millions of years following their debut during the Cambrian Explosion, she said, but scientists have been able to uncover bits and pieces of bone, and the odd whole-body fossil, from the Ordovician period starting at about 480 million years ago. Nothing, however, has been found in fossilised ecosystems such as coral reefs. 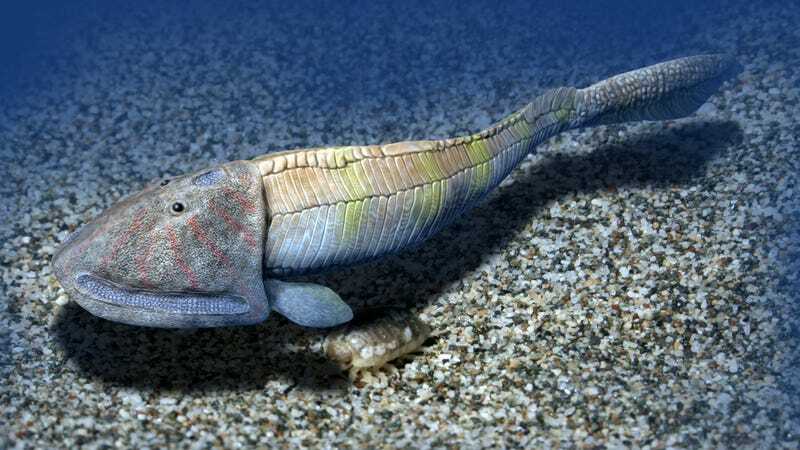 Then in the Silurian period, starting around 443 million years ago, a large number of jawed and jawless animals suddenly appeared all at once, noted Salan. The big question that scientists have been asking is why—and under which conditions—this dramatic transformation took place. Artist’s depiction of an armoured jawless fish, from about 425 million years ago. Salan said new developments in quantitative methods are finally allowing scientists to test theories about the ancestral habitats of vertebrates, as opposed to just making educated guesses. The shallow-water lagoons lining the mid-Paleozoic coastline, this research suggests, served as a springboard for all major groups of early vertebrates over a period of 100 million years. As these creatures evolved and diversified, their bodies adapted in ways that eventually allowed them to spread into new environments; tough, durable animals stayed nearshore or moved into freshwater habitats like lakes and rivers, while more delicate, flexible creatures ventured to deep water to avoid the increasingly hostile competition, the researchers speculate. This study only covers the initial phases of vertebrate evolution. Looking ahead to future research, Salan said her team would like to know if this primordial water cradle persisted through time, or if other environments, such as corals, somehow contributed to the emergence of new fish groups. The diversification of early vertebrates was contingent on the presence of shallow waters, this research suggests. A relevant question to ask is whether similar constraints exist elsewhere, namely on habitable exoplanets. A surprising finding from astronomy is that most habitable Earth-like planets may be waterworlds. Such planets would be devoid of shallow areas, with deep waters enveloping the entire globe. It’s possible that microbial life could emerge on waterworlds, and even evolve into primitive fish-like creatures, but without nearshore environments, these organisms might not be able to graduate to the next level of evolutionary complexity. It’s yet another potential sign that the conditions required to support the emergence of intelligent life in the cosmos are exceedingly rare.